Rodney McAree says his Coleraine team are determined to retain the Irish Cup as they prepare to face Crusaders in the Oval semi-final. "Crusaders are an extremely good side and they've been very successful - we'll respect but not fear them and it's a great opportunity," he added. "Coleraine have really enjoyed having the Irish Cup in their hands. "That's something the players. board and supporters do not want to give up lightly." The holders showed their grit and quality in coming from behind to beat Championship winners Larne in an eight-goal thriller in the quarter-finals. However, McAree's team go into the last-four showdown on the back of the disappointing 1-0 defeat by neighbours Institute last Saturday. "Before the Institute game you probably had it in your head what team was going to play in the semi-final," said the Bannsiders boss. "Now it's maybe opened the door for others - we missed key personnel and missed a bit of leadership so hopefully we'll have that coming back into the team. "You know what the team is capable of and when they don't deliver it feels as if you're being cheated a little. "But whenever you're going into a semi-final of the Irish Cup, the one thing you can guarantee is that you will get that hard work, you'll get that effort and we then have to find the quality to go with it." Coleraine enjoyed two victories over the Premiership champions this season before the Crues won the last meeting 4-2 at Seaview in February. 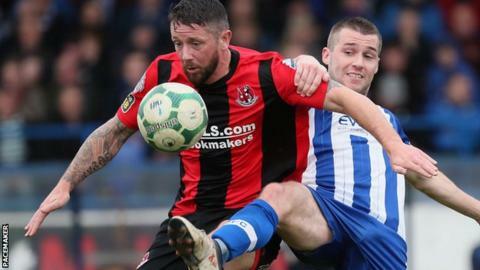 Crusaders won the Co Antrim Shield earlier this month but are out of title contention, leaving the Irish Cup as the big prize for the north Belfast side. "It's a massive game of football - we've not won the Irish Cup for 10 years," said Crues manager Stephen Baxter. "Coleraine are a superb side and we've had some great games with them. They've been good, very even matches and I'm sure it will be another tough encounter. "We've come through a couple of big games already in the competition and this is another huge one. "Both teams have not done as well in the league as they would have hoped, so I think it's a case of all eggs in one basket. "We're looking forward to it - it's what football is all about, being in these games and we are relishing the challenge."